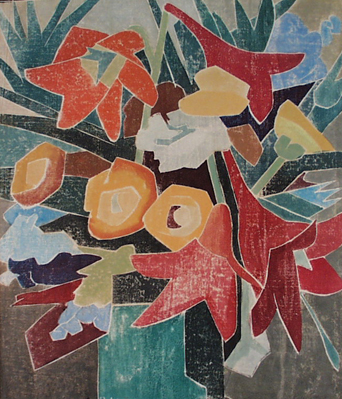 Beginning in 1916, a small group of printmakers working in Provincetown, Massachusetts developed a unique type of color woodcut. As opposed to "traditional " (Japanese-style) color woodcuts which employed a separate block of or each color, the Provincetown Printers used only a single block with different areas of color separated by a thin carved groove to keep the colors from running together. On the finished print, the groove "printed" as a white line separating the colors (hence the alternate name "white-line" woodcut). These print s are very distinctive and are often confused with watercolors because of the soft colors often employed. The artists listed under “Sought Artists” were known to have created Provincetown white line color woodcuts. Some artists such as Blanche Lazzell, Agnes Weinrich and Ada Gilmore produced a large body of work in this medium. Others worked at it for only a short time and produced few prints. I am paying exceptional prices for these kinds of prints whether by major or minor artists-even unsigned works. Provincetown scenes are especially desirable.